Fixing Up your home before putting it up for sale is always a good idea. Here are the Top 4 renovations that can help you to sell your house faster, and for more money. 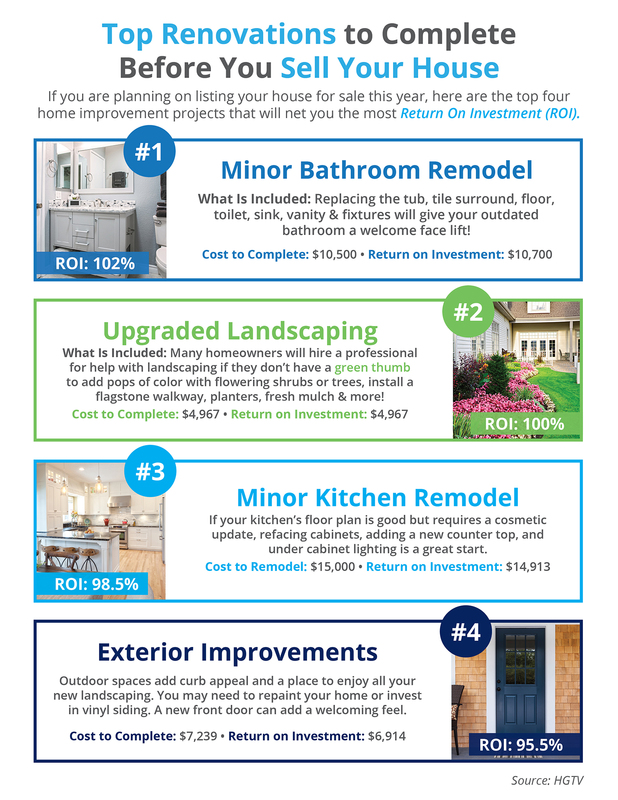 These renos have a proven track record of Return on Investment (ROI). Doing a few minor bathroom renovations is the number one thing that you can do to help you sell faster, and for more money. Minor kitchen renovations the second most important interior area where, done properly, you can maximize your selling changes and rate of return. Upgrading your landscaping or outdoor curb appeal of the house helps get buyers in the door. These upgrades rank as the 2nd and 4th best renovations for returns on investment. My latest video takes a look at the slump that Vancouver B.C. endured, when they brought in their “Foreign Buyer Speculation Tax”, and we check for what parallels may exist between their experience, and what we are currently experiencing here in the Greater Toronto Area. While it’s not precise science, we can see what lessons our sister city on the west coast may have for us. Hey there everybody. It’s Randy Selzer here. Welcome back to my real estate channel. Today is kind of a red letter day. It’s actually April the 20th, 2017, and today our provincial government here in the province of Ontario rolled out a major initiative on real estate in trying to cool off the real estate market. They rolled out a plan with 16 different components that they’re going to be implementing, which is going to, I think, drastically affect the real estate market here locally. Anyways, today we’re only going to talk about one thing, the first item out of the 16. That is the imposition of a foreign buyer’s speculation tax, is what they’re calling it, a non-resident speculation tax, which they’re going to be rolling out in the very near future, and, which will consist of a 15% tax to pay on closing when a foreigner, or a non-resident of Canada, purchases residential real estate in the province of Ontario. Before we get into the details, this is going to apply for a large area of southern Ontario, basically going from Niagara Falls up to Hamilton, out to the west towards Kitchener-Waterloo, all throughout the GTA, north to Orillia and Barrie, over eastwards to the Kawarthas and Peterborough, so it’s a large chunk of southern Ontario where this tax will apply. Although it hasn’t been put into law yet, they have to put it through the legislature to make it into law, it will be retroactive to tomorrow, April the 21st. Anyone entering into an agreement of purchase and sale, if that purchaser does not live in Canada, and they’re a non-resident, non-Canadian, they will be obliged to pay a 15% tax on their purchase of residential property going forward. That’s going to be a major effect, I think, on the local market. There are a number of different details, which they’ve released. I think some of the stuff is probably still being worked out. There’s going to be certain exemptions. For example, if a foreigner, non-resident, is married to a Canadian citizen, there will be no tax to pay. That’s interesting. I can foresee perhaps there will be a lot of marriages coming up to Canadians in the near future, because that will make them exempt from the tax. There’s also going to be some provisions where people can get their … If they pay the tax, they’ll be able to get that money back if they immigrate to Canada within four years of purchasing the property and paying the tax. They can get that money back, apparently, with interest. That’s in the press release that the government put out. Also, there’s going to be some special provisions for students. I believe what they said was that if a student has been going to school here for at least two years, that student may be able to purchase some property without paying the tax. That’s a good thing, because I know for a fact that there are a lot of parents who send their kids here for university, and they like to buy a condo for them to live in during the course of their studies, rather than pay rent. Hopefully that’s going to mitigate things a little bit. Let’s talk a little bit about the history of the tax. This 15% tax was originally rolled out in British Columbia last year, in 2016, in the greater Vancouver area. The people there, the politicians there, were trying to do the same thing to slow down the booming Vancouver real estate market. Vancouver’s a little different, in that they determined that about 10^% of all the purchasers in Vancouver were foreign buyers, people from other countries who are buying property in the Vancouver area. Toronto’s numbers are a little bit lower. We had to complete a survey last year conducted by Ipsos Reid, was mandatory for all of the realtors to do, and they were able to determine that in Toronto, it’s about half that amount. Somewhere between 4% and 5% of all the purchases, all the buyers in the Toronto area, are foreign buyers. When Vancouver rolled out the tax last summer, there was an immediate effect. Basically, all the foreign buyers dried up. They stopped … Very few people are going to pay on a $1 million purchase of a home, very few people want to pay $150,000 in tax, in addition to the basic land transfer tax on the day they get their keys. I think very few people, no matter how wealthy you are, are willing to spend that kind of money just to pay a tax. That dried up right away. But an interesting thing happened in B.C., where the local buyers, Canadian buyers, also decided to step back, because they wanted to wait and see where the prices would fall. It became a self-fulfilling prophecy, and prices and activity did fall rather dramatically in the Vancouver area over the course of last summer and fall. What we see now is that the Vancouver market seems to have picked up again, and even without foreign buyers, and it seems to be headed upwards once again. Whether or not this drop will happen here in the Toronto area, we’re not sure yet. Again, this was just announced this morning, and we’ll have to be watching the market very carefully going forward to see where it’s headed. There’s something I’d like to mention. This was rolled out, again, this morning. They’re calling it a non-resident speculation tax. I have a problem with this, the way they’ve packaged this, because think about it. If a Canadian buys a house in Florida, does that automatically make them a speculator? Or if a wealthy Canadian buys a condo in New York City, does that automatically make them a speculator? Or could it just possibly be that they want to invest in that property in Florida, or in New York, just for their own benefit, or to rent out, or just simply as an investment? The fact that they rolled it out as a speculation tax, I think is a little bit disingenuous. Let’s not make these people into the bogey man. This 5% of the buyers out there, they’re not the ones that are driving the market. The fact that they’re calling it a speculation tax is really not at all the situation. You can’t call anybody who buys a house, a foreigner who buys a property in Canada, automatically a speculator. I just wanted to mention that. Anyway, so anyway you look at it though, this is going to take effect once they pass it into law. It will take effect, and the lawyers are going to be busy if there’s anybody, foreign countries, who decides to purchase property. It’s just for residential properties. It is only for units up to six residential units. It’s going to apply for houses, and semis, and townhouses, and condos, up to six units, so duplexes, and triplexes, up to six-plexes. Anything over that, like a large apartment building, for example, if an investor wants to buy that, and they happen to live overseas, there’s no tax to pay on it, so only up to six units. Anyways, that’s the first of the 16. That’s all we’re going to talk about today. I’m not sure this is the best thing for our government to be doing. It’s not addressing the primary problem that we have in the real estate market here, which is so simple. We have an imbalance of supply and demand. There’s more demand than there is supply. For every house that comes on the market, every house or condo, there’s 10, or 15, or 20 buyers that want to buy it. That’s an imbalance. By imposing this tax, I think it’s too superficial. That’s not really the problem we have, but we’ll talk about that another time. Anyways, thank you for joining me again today. It’s always a pleasure to talk to you. If you have any comments, if you’re on YouTube, I welcome them. If you’re on any other social media, I always like to talk to you guys. If you want to call me or text me, 416-433-3556, and I’d be happy to talk to you. Thanks a lot, and have a great day. Bye. Here is our latest video on the Mississauga real estate market. We take a look back at 2016, and a look ahead to 2017. All signs point to continued strength in the market, as the three ‘pillars’ which are driving it – low interest rates, a decent local economy, and ongoing immigration into the Greater Toronto Area, are maintained. Will the ‘wild cards’ of the election of Donald Trump in the U.S.A., and the increased tightening of mortgage approval requirements by regulators in Canada, have an effect? Watch the video to find out. January numbers are already in the books, and local newspapers are publishing reports of incredible bidding wars on average houses. It looks like we are in for another interesting year. Hello everybody, it’s Randy Selzer here. Once again, thank you for joining me here on my YouTube channel, and how are you? Hope all is well, welcome back. Today, we’re going to look back a little bit at 2016 and see what happened in the market, and we’re also going to look forward to what to expect in 2017 in the real estate market here in Mississauga and also in the Greater Toronto Area. I think most of you are well aware that the, 2016 was incredible. The numbers have come out from the real estate board, and they’re showing about a 23% increase in average prices year over year, which is just an incredible amount to look at, and that’s a historical amount. So that’s all great news if you’re a homeowner. If you’re a home buyer, it was very difficult throughout the year, trying to chase these listings when they came out, so many bidding wars, and pretty well every house had multiple offers on it, and condos, too, really picked up, especially in the last half of the year; so, as we look forward to 2017, I see a couple of competing things. I think the fundamentals are still there, which is what I like to talk about, the three pillars which are driving the market, and that is low interest rates, a decent economy in general, as well as immigration into the Greater Toronto Area, so those three things are still in place, and that’s all good news for real estate. Also, just very recently, the CMHC fees were increased, and those are the insurance fees that a high-ratio buyer has to pay when getting a mortgage loan, so those two things have combined to make it considerably tougher, especially for first-time buyers, to get into the market. I think what we’re going to see is continued strength in the market for the first half of the year, and I think as these sort of legislative changes take effect, or they’ve taken effect, but as they kind of sift through the market, you may see some decrease in demand perhaps in the second half of the year, but I don’t have a crystal ball. These are just best guesses that I can come up with for where the market is headed. For investors, the news, also, has been really good. The rental market has been extremely strong, rents are extremely high, and basically, everything is getting snapped up the minute it comes out; so for a rental, if you’re looking at making an investment and renting it out, specifically condos in Mississauga or wherever, that is, we predict that that’s going to continue, because a lot of people are simply priced out of the market to purchase, so they’re going to continue to rent, and that’s going to provide a nice pool of renters for investors. Anyway, stick with me, we’re going to continue to do videos throughout the year. Hopefully, we can keep abreast of any of the changes that take place, and I wish you all well. Once again, if you have any comments, please feel free, on YouTube or any of the social media, to make comments, and I hope you get a kick out of these videos as much as I get a kick out of making them. Anyways, have a great day, and we’ll talk to you again soon. Bye.